gardening in the boroughs of nyc: Burpee, you redeemed yourself yet again, Part 2. 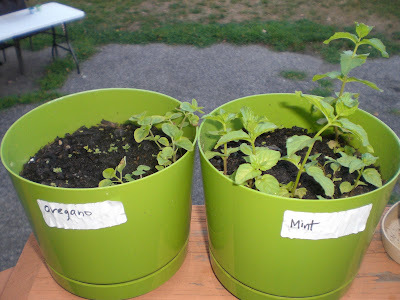 Okay, maybe I got a couple of bad Burpee packets seeds for the first couple of times I tried to grow oregano and mint. I tried to grow them indoors and after a month nothing sprouted, so I gave up. All of the vegetable plants I have out in the garden I grew from seed, so it was so frustrating that I couldn't get the herbs to germinate. But I still wanted to try it again, so I bought the same seeds (I know, I'm a glutton for punishment) and this time I left them on my back porch to try to get them to germinate. I wrote a post about it here. At first there was nothing. Two Weeks went by and I saw one seed germinate in the mint container. Finally, a month later, we're seeing more action in those pots. We got more plants sprouting up. Hallelujah! Congratulations on germination! I rarely grow herbs from seed, I think that generally they have poor germination rate. Wish you years of oregano and mint harvests! Some of the herbs take a long time to germinate. You will be able to plant the oregano in a bed. It will come back year after year. I do not plant mint in a bed. It will take over! I keep all of my mints in pots outside. They will come back too! 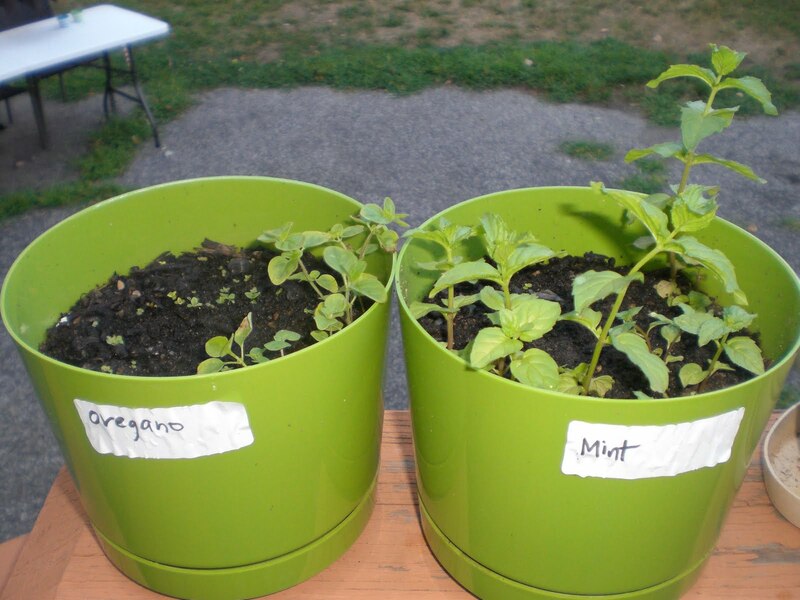 You can also put the pots of mint in the veggie garden between plants to deter bugs! They could have been too deep in the garden. Or the opposite happened, when you watered them they could have gotten disrupted in the soil. I see mint tea in your future. Just don't plant it in your garden...it grows like crazy. Don't get discouraged, some herbs are difficult to germinate, parsley is notorious for this, taking 20-30 days! I have found greater success in direct sowing many. Let your oregano flower to seed outside, my oregano and parsley reseeds itself profusely with no intervention - but as soon as I want to "cultivate and pamper" seeds they won't grow LOL! You are one determined new gardener! You may inspire me to try growing more herbs from seeds. I just plant the annual ones from seed, but still get some parlsey and such as plants. Whoo Hooo!!! I have a goal this week to plant herbs in pots to keep in my kitchen during the winter. I didn't have much luck planting them from seed in my herb patch either. (with the acception of my wonderful basil). Send some of that herb luck my way!!! yay! I started some herbs from seed a couple years ago. They were kind of pathetic the first year, but this year look great! I guess herbs are tricky. Congratulations on your Mint & Oregano finally germinating. I've had very little success with growing stuff from seed indoors. Wow, growing herbs from seed can be my next project. Congratulations on getting them to grow.